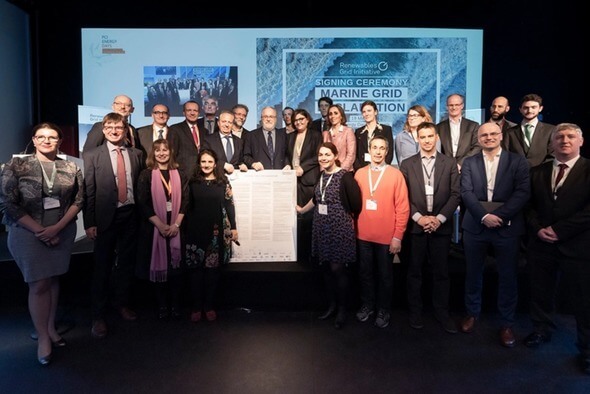 The Declaration lays out principles specific to grid deployment in the marine environment, including promotion of environmentally-sound projects, early stakeholder engagement and knowledge sharing and has been signed by Transmission System Operators, NGO and other industry associations. The Declaration supports the smooth deployment of the offshore infrastructure needed to integrate a growing amount of renewables and meet Europe’s climate and energy targets. It also promotes carefully planned and sustainable projects that will facilitate permitting allowing for higher shares of wind energy in the power system. WindEurope CEO Giles Dickson also participated in a panel discussion entitled, ‘Building a future-proof energy system’. Wind now meets 14% of the EU’s power demand on average, said Dickson, but the International Energy Agency recently published figures showing the share of wind in the electricity mix will increase to 34% by 2040. Europe will need to build much more renewable energy capacity to reach the 32% renewables target for 2030 and beyond and wind will be the key delivering technology for this, said Dickson. Electricity is only 24% of Europe’s energy mix today. Ramping this up to more than 60% by 2050 is realistic and affordable. But this will require progress in the electrification of industry, buildings and transport. It will also require significant investment in the repowering and lifetime extension of existing wind farms. Nearly half of Europe’s existing wind farms will reach the end of their normal operational life by 2030, said Dickson.